In the automotive industry, manufacturing speed, quality, and quick changeover is key to a successful organization. Recently, a tier 2 automotive manufacturer was using traveling pinboards to manufacture wiring harnesses. This process required workers to walk with the part to accomplish their task then return to their starting point. At the end of the process, the part was checked for quality, ensuring a good part. The company needed a solution that would increase quality, throughput, enable faster changeover and be more ergonomic for the workers. The solution needed to have a short lead time to meet the compressed installation schedule. Dorner worked with the customer to supply 2200 Series Precision Move Pallet System conveyors for two manufacturing lines. The modular solution included: Conveyors, Lift and Locate stations and 90 degree Pin Tracking corners. The Lift and Locate stations enable workers to perform their task in a comfortable position without the need to walk with the part. 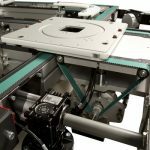 It also provides repeatable positioning for the automated manufacturing process integrated alongside the manual process and quality control at each assembly station. If a part does not pass the quality check it is corrected or discarded at that station rather than making its way through the entire process, saving time and materials. 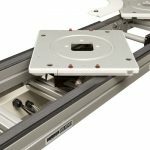 The 90 degree Pin Tracking corners maintain a leading-edge orientation of the pallet with minimal guiding and eliminate the need for extra drives or more complicated automation modules. Standard pallets with custom fixtures, which weigh ~ 45 lbs., can be changed out as product requirements change without changing the base conveyor system. When throughput requirements increase, additional stations can be added. The modular system can be expanded by simply adding additional conveyor sections. Thanks to Dorner’s expertise and short lead time, the company was able to get up and running on schedule.